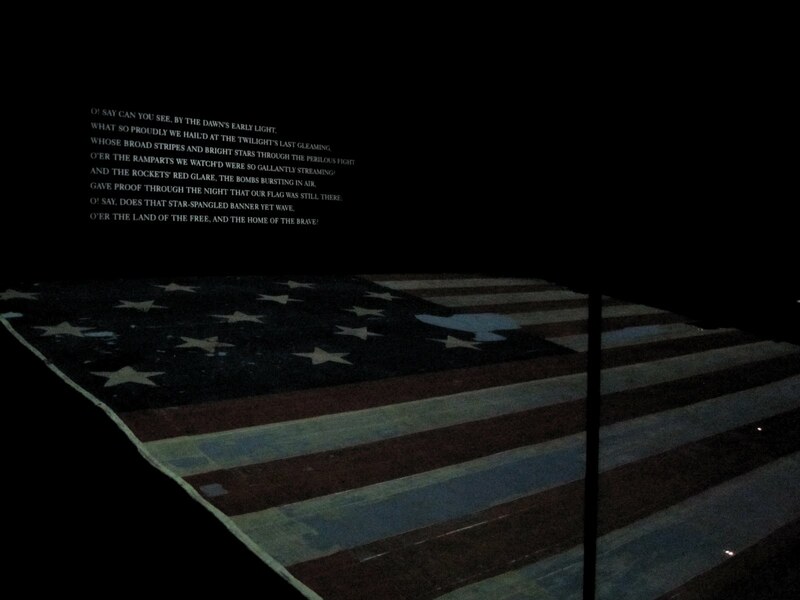 The Star Spangle Banner on view in the National Museum of American History. My girlfriend and I spent four days in Washington D.C. last week. One of the highlights of the trip for me (and even for my non-flag nerd girlfriend) was seeing the Star Spangled Banner, the very flag that inspired Francis Scott Key to write the American national anthem during the Battle of Baltimore. Tensions between America and the United Kingdom were high in the early 1800s for several reasons, such as trade restrictions against America and UK’s Royal Navy taking American sailors. Determined to prove ourselves again against the UK, we declared War in June 18, 1812. Two years into the War of 1812, it became clear that America bit off more than we could chew. Having just captured and burned Washington D.C. to the ground, the British turned their sights to Baltimore, a key strategic port city for the area. America’s morale was at an all-time-low and everyone was resting their last hopes on Baltimore’s harbor defense anchored by Fort McHenry. The floor plan of Pickersgill’s house with a scale representation of The Star Spangled Banner layered on top. As Fort McHenry prepared for the inevitable attack, its commanding officers wanted “a flag so large that the British would have no difficulty seeing it from a distance”. They contracted flag maker Mary Pickersgill to make two flags for the fort; one very large and one smaller “Storm Flag” to fly during bad weather. The large flag was an astonishing 30 ft. by 42 ft.; larger than Pickersgill’s house. Later stages of production had to be moved to a nearby brewery that could fit the flag. The floor plan of Pickersgill’s house is pictured to the right with a scale representation of The Star Spangled Banner layered on top. On Sept. 13, the British began bombarding Fort McHenry for 25 straight hours with cannons, mortar bombs, and a revolutionary €œCongreve Rocket€ that produced a red glare. However, the bombardment did little damage to the fort. Realizing that they would not be able to pass the fort safely into the harbor, the Royal Navy retreated. Fort McHenry flying a replica of the Star Spangled Banner. Prior to the battle, Francis Scott Key, a Baltimore lawyer, was in negotiation with the British to release a prisoner. During the negotiations, Key saw the British’s plan for the battle. Fearing Key would inform the American troops, the British detained him. Key was able to see the entire battle from his cell. A storm raged during the nighttime hours of the battle, prompting the fort to fly the smaller Storm Flag. The only way Key was able to see the flag throughout the night was from the Congreve Rocket’s €œred glare€ and the €œbombs bursting in air.€ When he awoke in the morning, he saw the larger flag flying over Fort McHenry, indicating that the Americans were victorious. The sight inspired him to write the poem that would eventually become our national anthem. The American flag at that time was very unique. It was the first iteration to add more stars to the original 13 in the blue canton, as Vermont and Kentucky had recently become the first states beyond the original 13 colonies. The flag was also the only iteration to have anything other than 13 stripes. This flag has 15, reflecting the number of states at the time, like the stars. The additional stripes brought the flag’s aspect ratio to 5/8 instead of the usual 19/20. The actual flag that flew over Fort McHenry, aptly named the €œStar Spangled Banner€, has been toured and displayed in various places throughout it’s life. The flag is currently 30 ft. by 34 ft. with the loss of size attributed to wear from use and many small fragments being snipped off during the 1800s as keepsakes. The flag currently only has 14 stars as one was cut out and is still unaccounted for. The first of many preservation efforts started in 1914 when the flag was attached to a linen support. Unfortunately, many of the preservation efforts ended up damaging the flag more than helping and the flag will never be able to support its own weight again. Today, the flag is housed in a permanent display in the National Museum of American History. You enter the exhibit in a corridor with signs and displays explaining some of the history leading up to the Battle of Baltimore. Then you round a corner to see the flag, laid out on a display at a ten-degree angle. The lights are kept very low and pictures are not allowed as even a flash could be detrimental to the fragile fabric (I did not take the picture shown, I found it online). Even if you are aware of the dimensions of the flag going into the exhibit, seeing it so close is an experience in itself. I have never been in a museum exhibit that was so quiet. It was akin to entering a tomb or attending a funeral; the only sound being a medley of different versions of the National Anthem softly playing over the PA system. It is something I will always remember. My girlfriend (I must reiterate, a non-flag nerd) confessed she was on the edge of tears. If you are ever in in Washington D.C. and have the opportunity to visit the Museum of American History (admission is free), I highly suggest taking the five minutes out of your day to visit the exhibit. If you can’t visit, the museum hosts a great interactive website on the exhibit. I also highly suggest watching the very funny Drunk History on Francis Scott Key, available on YouTube.